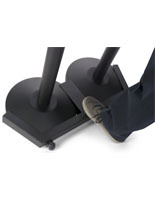 How are stanchion sign holders used to organize foot traffic? These floor stands and retractable line queuing systems are typically used in museums, theaters, concert halls, cinemas, and nightclubs. Eliminate the need for hiring additional event staff with silent crowd control barriers. Organize lines and mark VIP areas with stanchion sign holders, also known as line queuing signage, with support post and rope systems sold at this website. Purchase these toppers for crowd control fixtures instead of investing in brand new systems that you only need parts of. 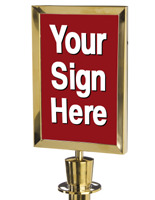 Each of these stanchion sign holders gets attached to floor standing poster fixtures available in brass, chrome, and black. Traditional and contemporary styles suit any environment, from A-list red carpet events, to gallery exhibits. 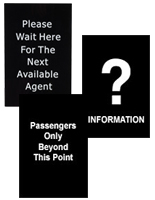 This line queuing signage for events can be purchased to complement current hardware, toppers, posts, and ropes from the Tensabarrier™ and QueuePole™ lines sold here. Improve traffic flow in a waiting and reception areas or at special events with modular guide systems for wall and floor from this website. Line queuing signage from this site assures a seamless match among modular parts, excellent quality, and a user-friendly design. No matter what the décor - traditional or contemporary - there is a fixture and accompanying accessories to suit your event and space. What line queuing signage components are available to organize foot traffic and protect displays? 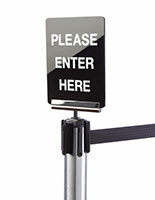 Stanchion sign holders direct foot traffic subtly at special events, exhibits, and openings as well as sectioning off areas for VIP’s at red carpet events. Typically seen in movie theaters, concert halls, upscale showrooms, crowd control posts and ropes with poster enclosures keep lines of visitors organized and directed. Vertical stock messages such as “Line Forms Here,” “Exit,” “Purchase Tickets Here,” “This Section Closed,” “Please Wait to be Seated,” "Passengers Only Beyond This Point," "No Smoking," "Please Wait Here for the Next Available Teller," "Wet Floor, Please be Careful," "Purchase Tickets Here," "Express Check In," "First Class Check In," can effectively queue traffic without hiring additional staff. 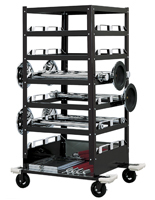 Crowd barrier carts made of steel, aluminum, and rubber with padded rails hold and protect 18 Tensabarrier™ posts (and surrounding walls) from scratches when rolling down a corridor. 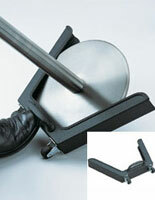 Rubber locking wheels make the trolley easy to maneuver from one venue to another. A built-in bottom storage area holds additional hardware and accessories. No one need put their back out when moving fixtures, thanks to this wheeled helper. 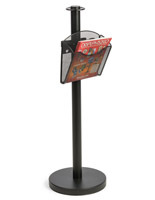 Silver, chrome, and black posts and Tensabarrier™ brackets sized 7” x 11” protect highlighted merchandise or exhibits from being tampered with, handled, or damaged by marking the area where visitors can gather. These crowd control floor stands do a tough job in style. Most of these enclosures rotate and swivel to display a message in any position. 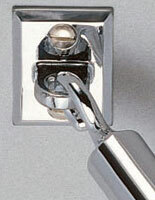 The bracket fits both bell and flat top posts, and comes with an adapter for mounting. Posters should be no more than .25” thick. 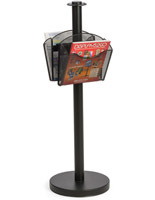 Receiver posts a deluxe round base and (2) magazine pockets hail from our QueuePoleDeluxe™ collection (rope and metal mesh pockets sold separately) and houses trifolds, magazines, and other promotional collateral. 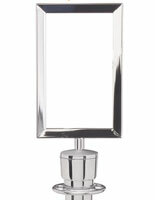 These floor standing fixtures are double sided with a floor standing design, steel construction and powder coated finish. A special dolly for hauling Tensabarrier™ posts and accessories can be pushed easily down a corridor or across a venue, preventing strain on the carrier and wear and tear on the polished finish of the fixtures. 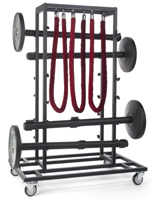 This accessory is a must-have for managers of large venues, and saves lots of time (and back injury) since many systems can be moved at the same time. 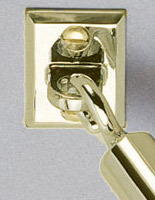 Chrome or brass wall plates ship with the necessary hardware (note that the hook accepts only one rope end) and are great for conserving floor space in a small or heavily trafficked venue. 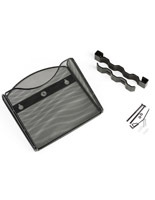 Sized 1 5/8" wide x 1.25" high, this mounting system extends 7/8" from the wall. 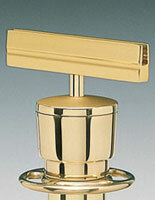 Available in polished brass or chrome, this hardware is compatible with the poles and toppers in our Tensabarrier™ line. Unlike portable pole systems, this product is designed for fixed installment. 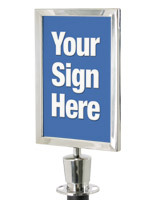 Stanchion sign frames are easy to assemble; just unscrew the post top and screw the enclosure into the post. 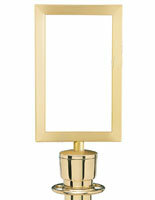 This assembly ships with an extender, tulip-top post topper and a barrier attachment ring. 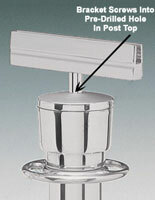 For those using a flat top QueuePole™ post, the hardware converts one of the posts to a tulip-topper design. These stanchion sign frames can be used as customizable guide systems and configured for different scenarios. Instead of replacing the whole floor standing system, update only the pieces you need to save money. These sign holders for crowd control can be used for dances, proms, and school events, as well as casinos, trade shows, motor cycle and auto shows, and in many other business and retail environments. Highlight large or unique wares and exhibits with posts and rope systems that display messaging. Keep visitors at bay while still allowing them to view highlighted objects such as a boat, car, or archaeological piece. Designate VIP sections at a bar, night club, or concert hall using durable, beautifully designed crowd control fixtures such as those featured here. 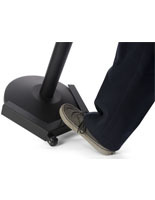 Organize foot traffic and create silent guides with post and rope systems with message enclosures and associated accessories.